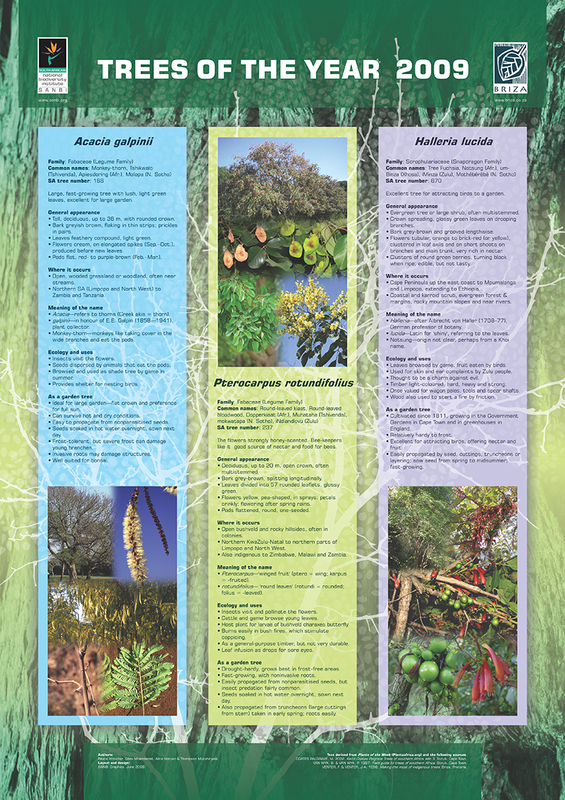 Full colour posters providing descriptions and photographs of these trees including common names and meanings of their scientific names. Detailed information on the general appearance, distribution and habitat, horticultural notes, ecology and other uses are discussed for each tree. 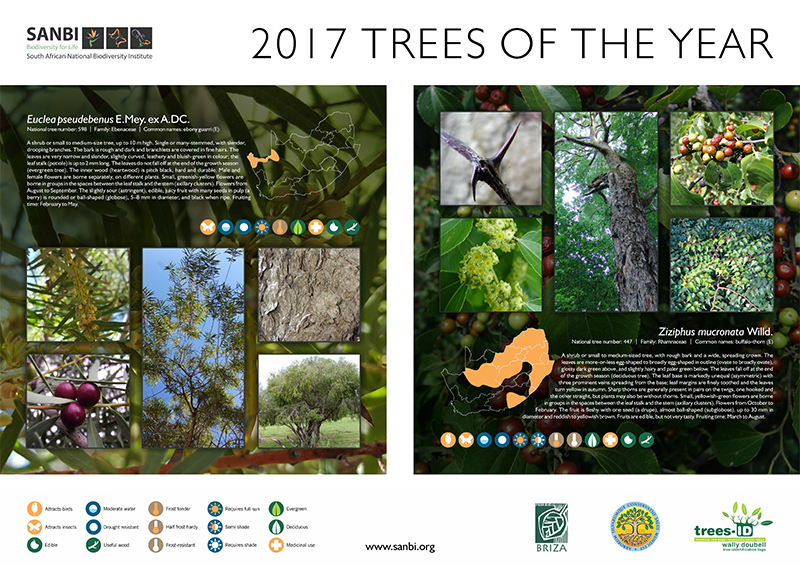 The 2017 trees of the year are Ziziphus mucronata (buffalo-thorn) and Euclea pseudebenus (ebony guarri). 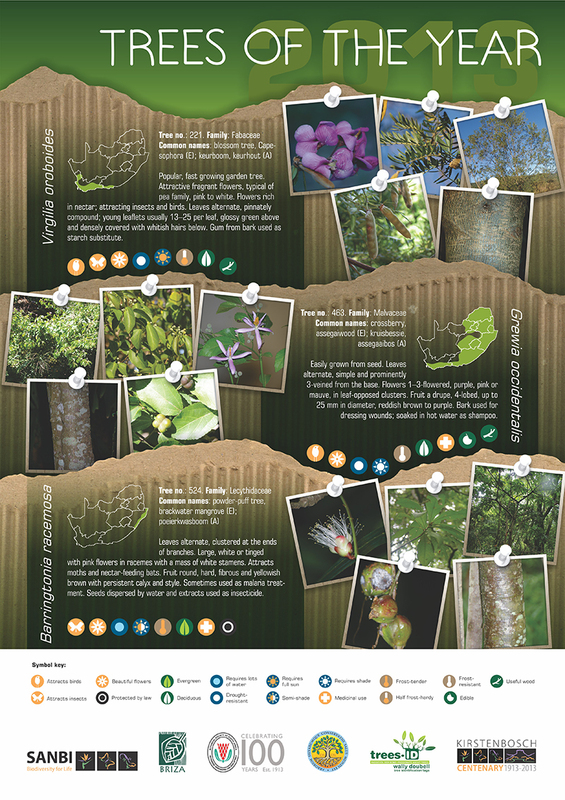 This full colour, double-sided poster, which folds up into an A5 brochure, provides descriptions and photographs of these trees including common names and meanings of their scientific names. Detailed information on the general appearance, distribution and habitat, horticultural notes, ecology and other uses are discussed for each tree. 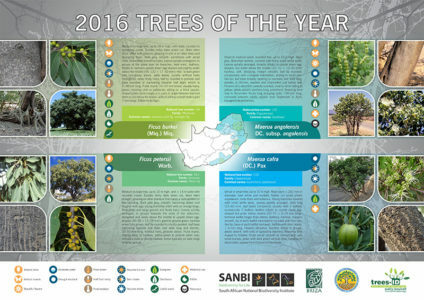 The 2016 trees of the year are Ficus burkei (common wild fig or strangler fig), F. petersii (Peter’s fig), Maerua angolensis subsp. angolensis (beadbean) and M. cafra (bushcherry or spiderbush). 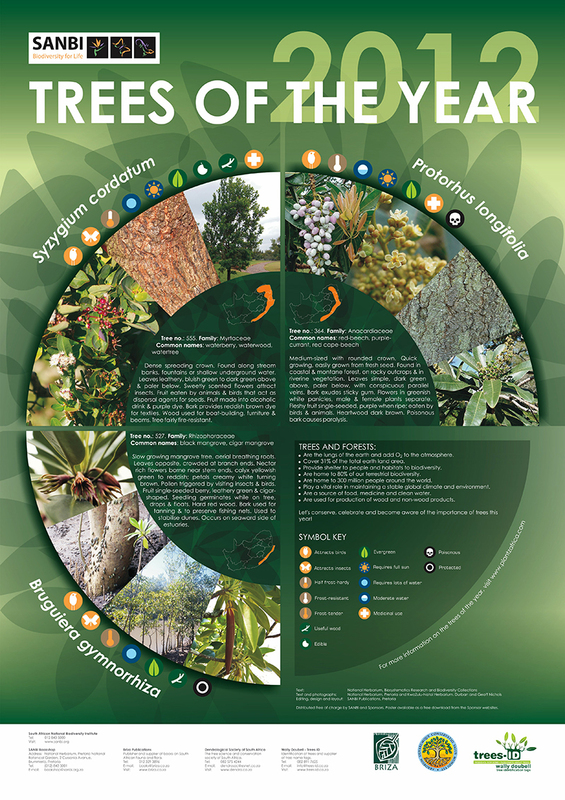 This full colour, double-sided poster, which folds up into an A5 brochure, provides descriptions and photographs of these trees including common names and meanings of their scientific names. Detailed information on the general appearance, distribution and habitat, horticultural notes, ecology and other uses are discussed for each tree. 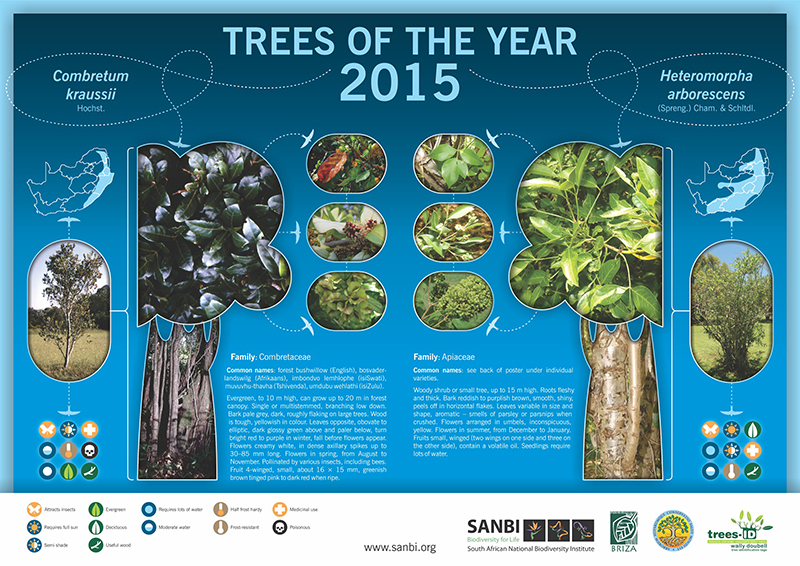 Posters are available free of charge from sponsors and the SANBI Bookshop (while stocks last). The 2015 trees of the year are Combretum kraussii and Heteromorpha arborescens (four varieties: var. arborescens, var. abyssinica, var. collina and var. frutescens). 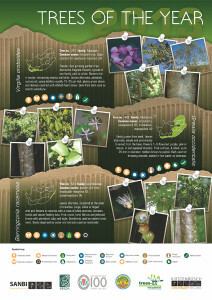 This full colour, double-sided poster, which folds up into an A5 brochure, provides descriptions and photographs of these trees including common names and meanings of their scientific names. Detailed information on the general appearance, distribution and habitat, horticultural notes, ecology and other uses are discussed for each tree. 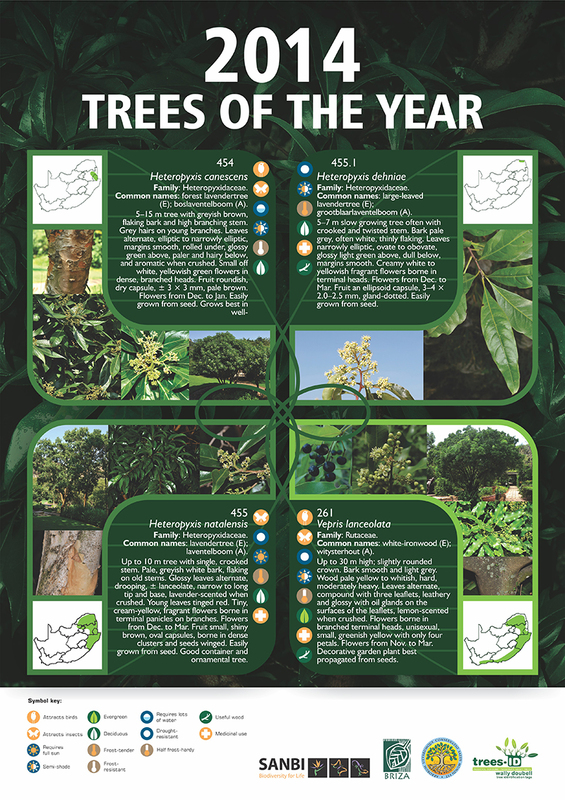 The 2014 trees of the year are Vepris lanceolata and the genus Heteropyxis (represented by H. canescens, H. dehniae and H. natalensis). 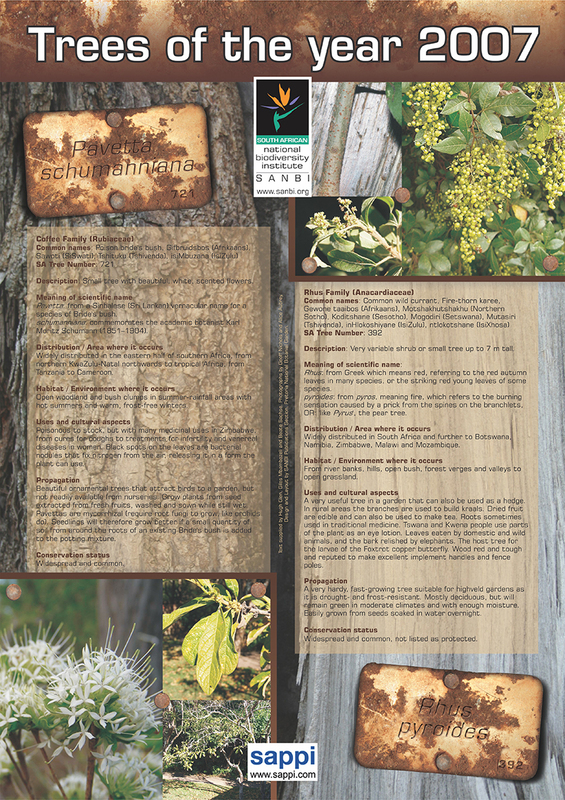 This full colour, A2, double-sided poster, which folds up into an A5 brochure, provides descriptions and photographs of these trees including common names and meanings of their scientific names. 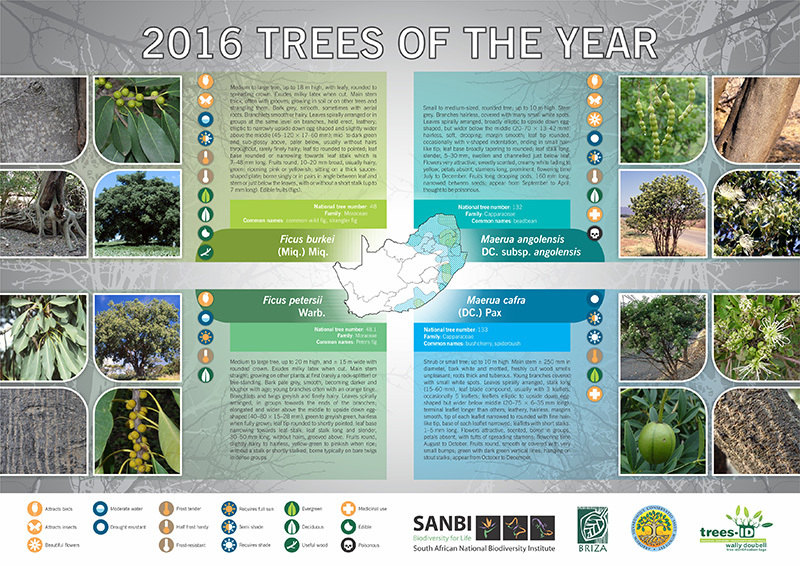 The trees of the year for 2013 are Virgilia oroboides (Fabaceae), Grewia occidentalis (Malvaceae) and Barringtonia racemosa (Lecythidaceae). This full colour, A2, double-sided poster, which folds up into an A5 brochure, provides descriptions and photographs for these trees including common names and meanings of the scientific names. The trees of the year for 2012 are Syzygium cordatum, Protorhus longifolia and Bruguiera gymnorrhiza. 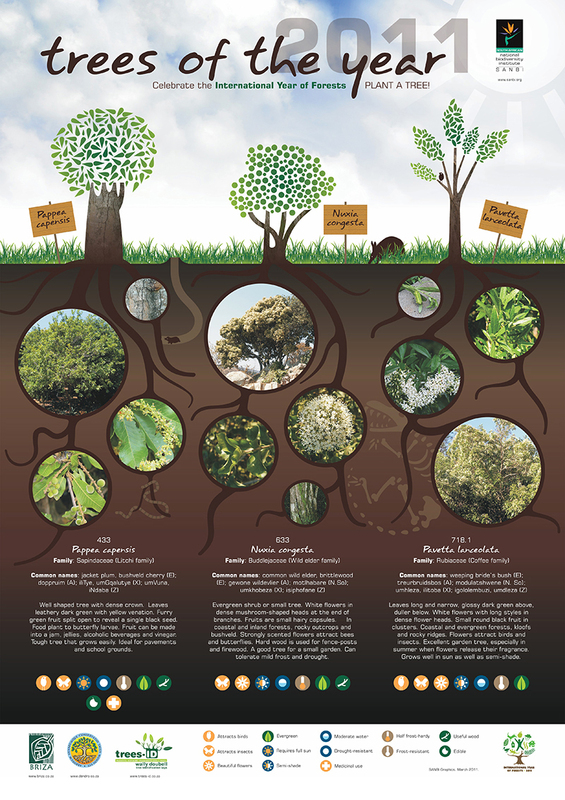 This full colour, A1 poster provides descriptions and photographs for these trees including common names and meanings of the scientific names. 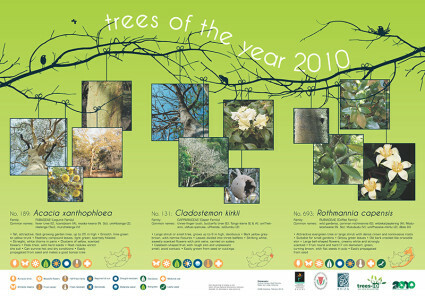 The trees of the year for 2011 are Pappea capensis, Nuxia congesta and Pavetta lanceolata. This full colour, A1 poster provides descriptions and photographs for these trees including common names and meanings of the scientific names. 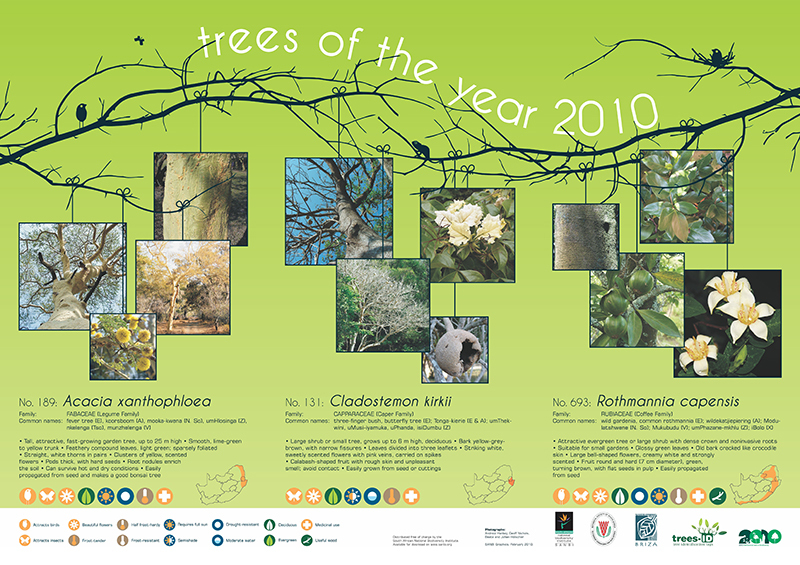 The trees of the year for 2009 are Acacia galpinii, Pterocarpus rotundifolius and Halleria lucida. 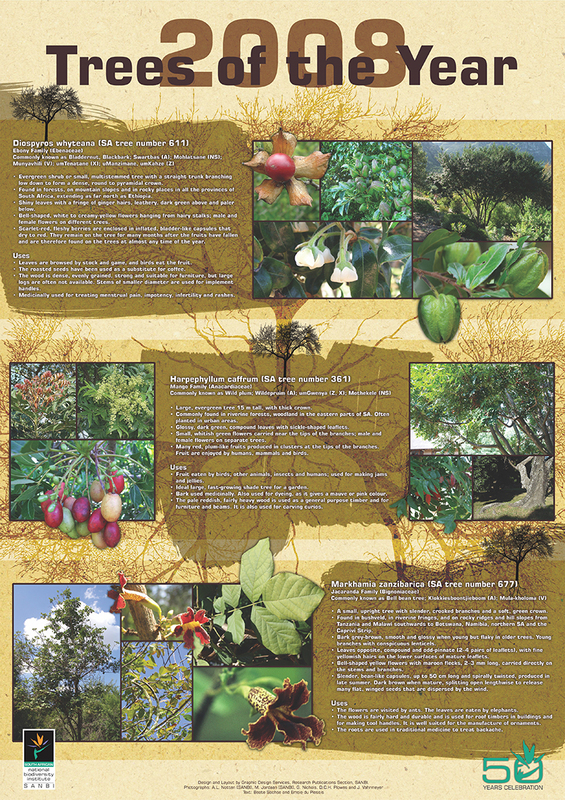 This full colour, A1 poster provides descriptions and photographs for these trees including common names and meanings of the scientific names. 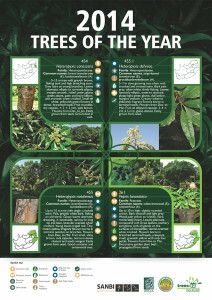 The trees of the year for 2008 are Diospyros whyteana, Harpephyllum caffrum and Markhamia zanzibarica. 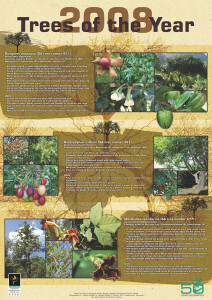 This full colour, A2 poster provides descriptions and photographs for these trees including common names and meanings of the scientific names. The trees of the year for 2007 are Pavetta schumanniana and Rhus pyroides. This full colour, A2 poster provides descriptions and photographs for these trees including common names and meanings of the scientific names.